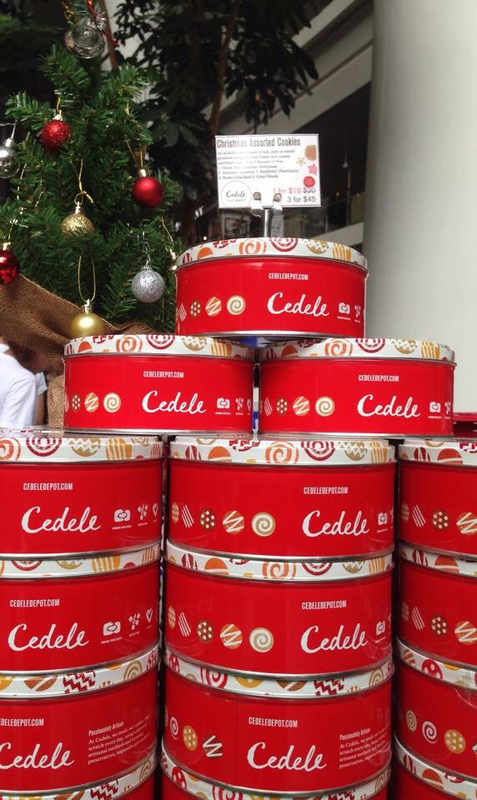 Recently, I attended Cedele's Christmas Market! 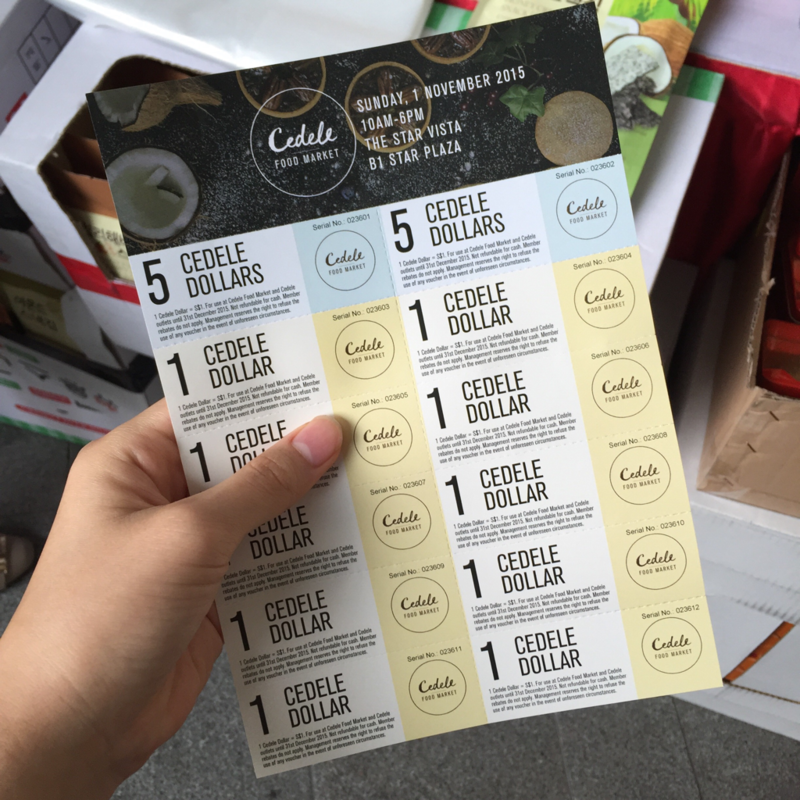 This isn't the first time as Cedele has held about two food markets before in the past. Unfortunately, I was unable to make it for those few times. This time, even though I had an exam the next day, but I really wanted to go and so I did. 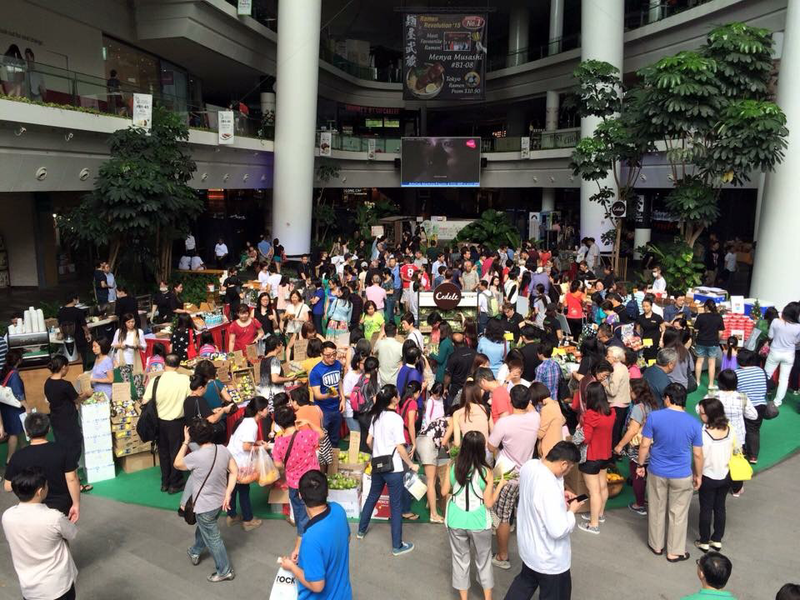 The Christmas Market was held from 10am to 6pm on 1st November 2015 @ The Star Vista, B1 Star Vista. 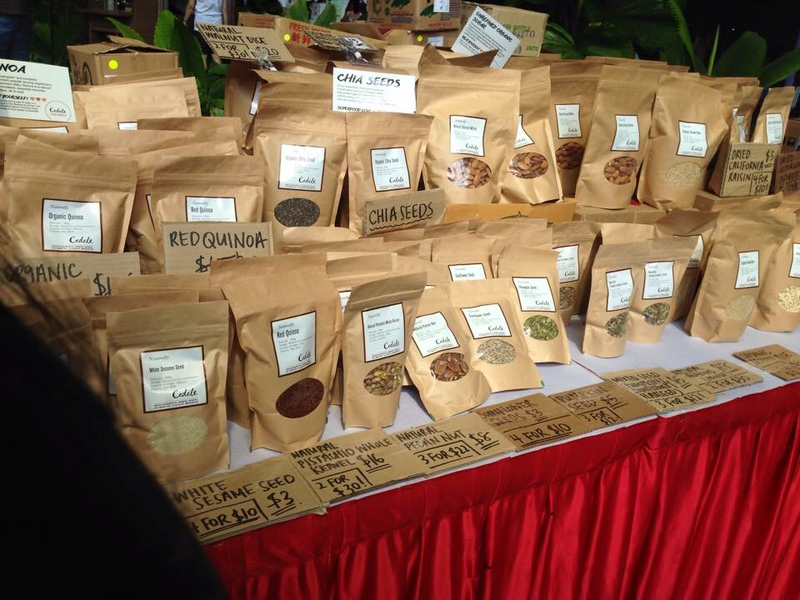 Unfortunately, I was unable to get good shots of the stalls that day so all the photos in this category is taken from Cedele Singapore's Facebook page. 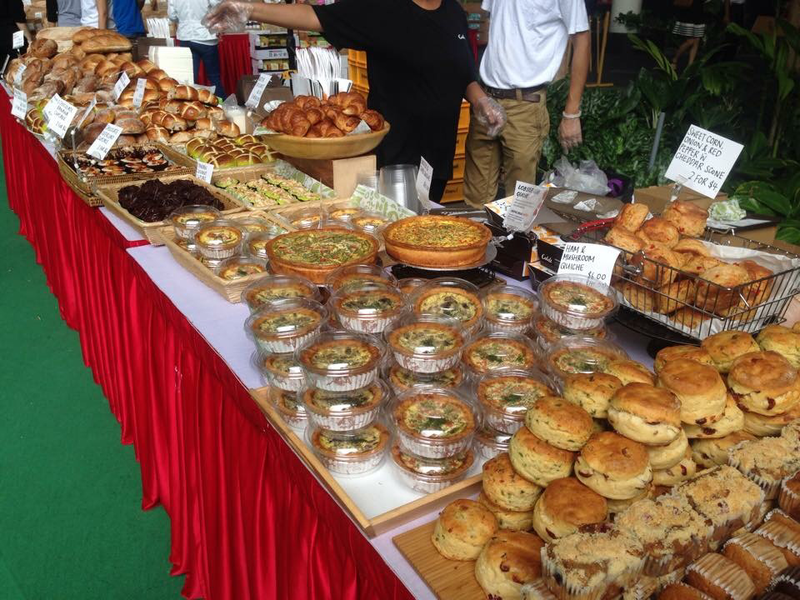 At the market, they were selling various signature artisan breads, pastries, gourmet sandwiches, fresh produce, dried goods & healthy snacks. 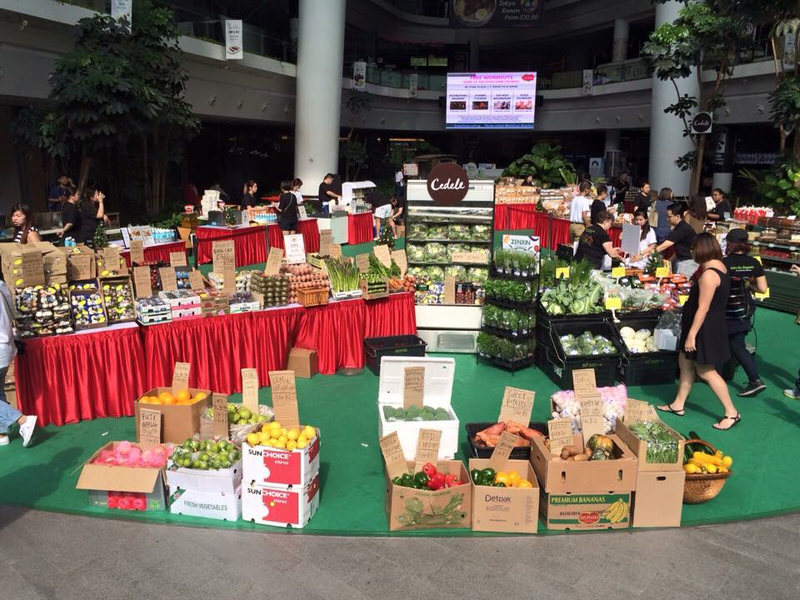 I really really enjoyed myself, hopping from one kiosk to another, sampling different types of food and buying all sorts of snacks and food. 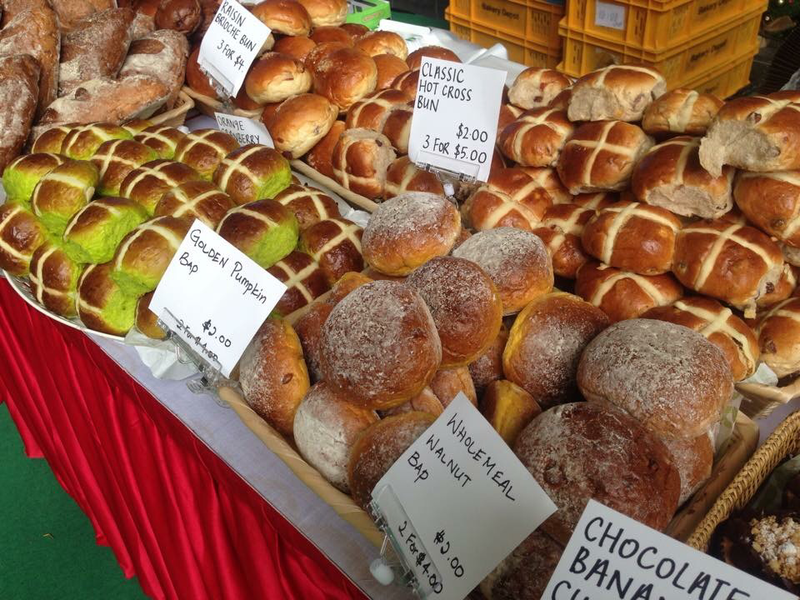 I'm not too sure about past food markets, but the turn up rate at the Christmas Market that day was extremely high. I must say that it was a complete success. The atmosphere there was really busy as people hustled and bustled around, squeezing through the crowd to get to the station they wanted to go to. There was a loudspeaker blaring with the live commentary about recommended food items sold at the market as well as pop music when the DJ wasn't speaking. This was part of lunch before going around for sampling! 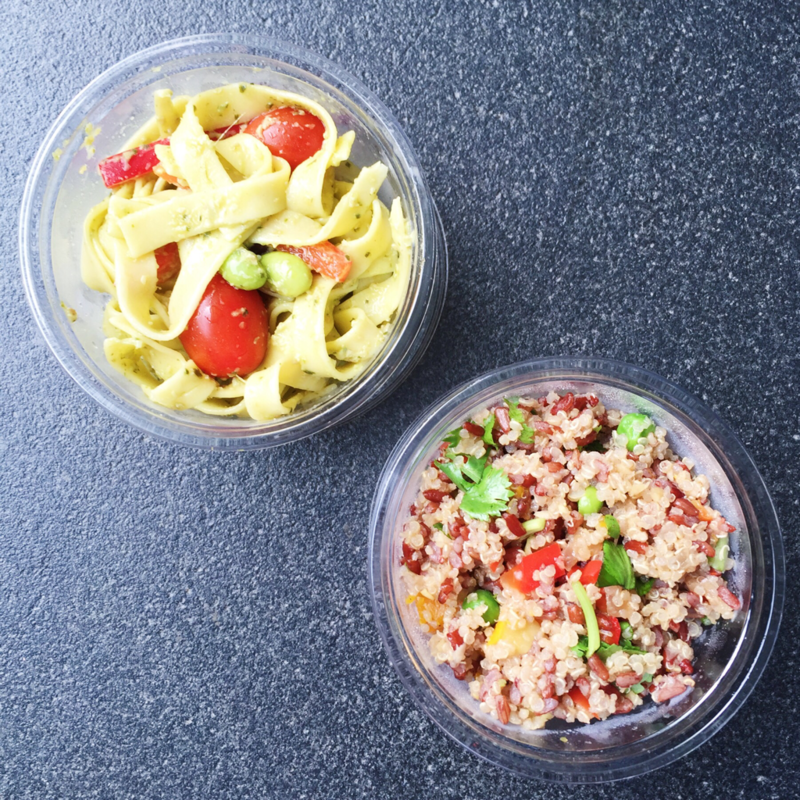 Pictured here is their Pesto Linguine Paste with Red Pepper, Edamame & Cherry Tomato (top) and their Quinoa & Red Rice Salad (bottom). Both are vegetarian. This salad was not bad. I liked how he pasta was soft yet chewy and of a nice texture. The pesto sauce it was coated in, however, was slightly thick and did not cost the pasta evenly. The sauce also lacked sufficient seasoning. However, the vegetables were nice and fresh and it was quite a refreshing salad overall. This salad, on the other hand, was mind-blowing. 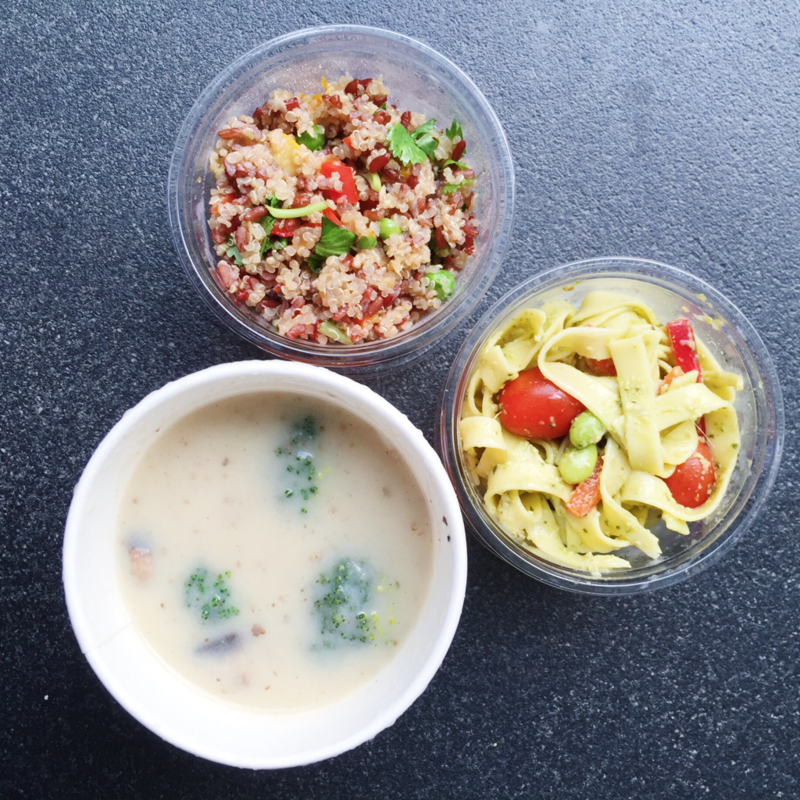 It contained many vegetables like pumpkin, bell pepper, edamame and parsley. It was seasoned with some sort of dressing that was really really tasty yet refreshing. 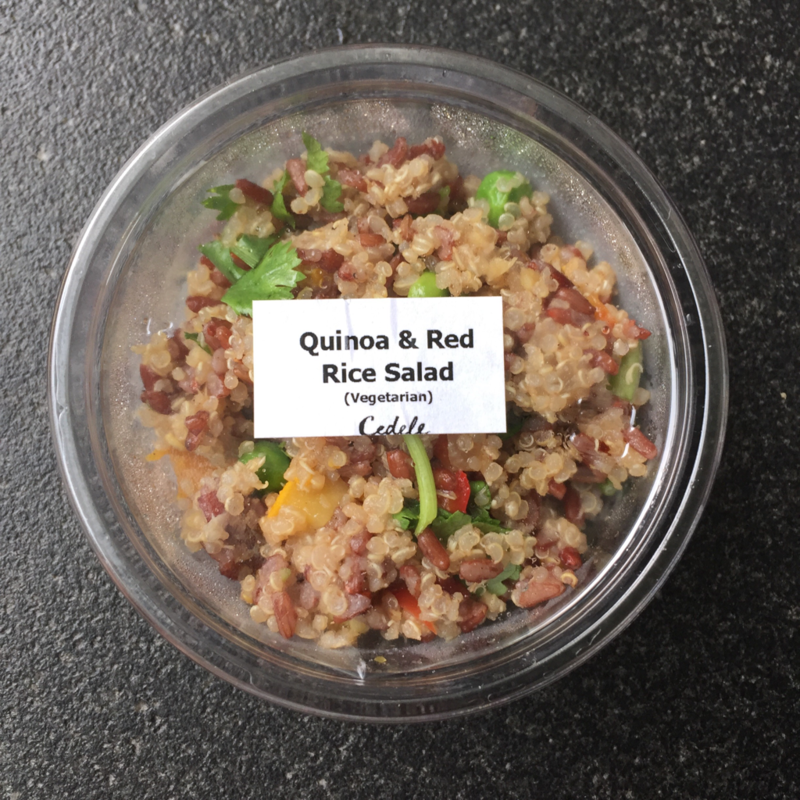 They serve this salad in the DIY salads at Toss & Turn and Cedele Salad Bars as well. These two, my dad bought home to eat. 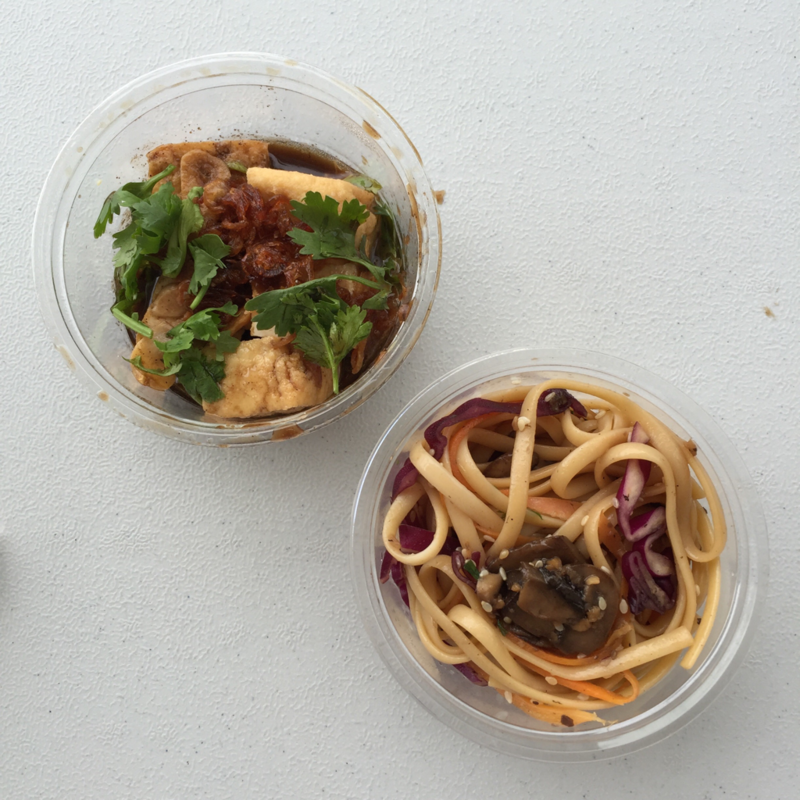 The Grilled 3-Mushroom Pasta (bottom) was amazing. 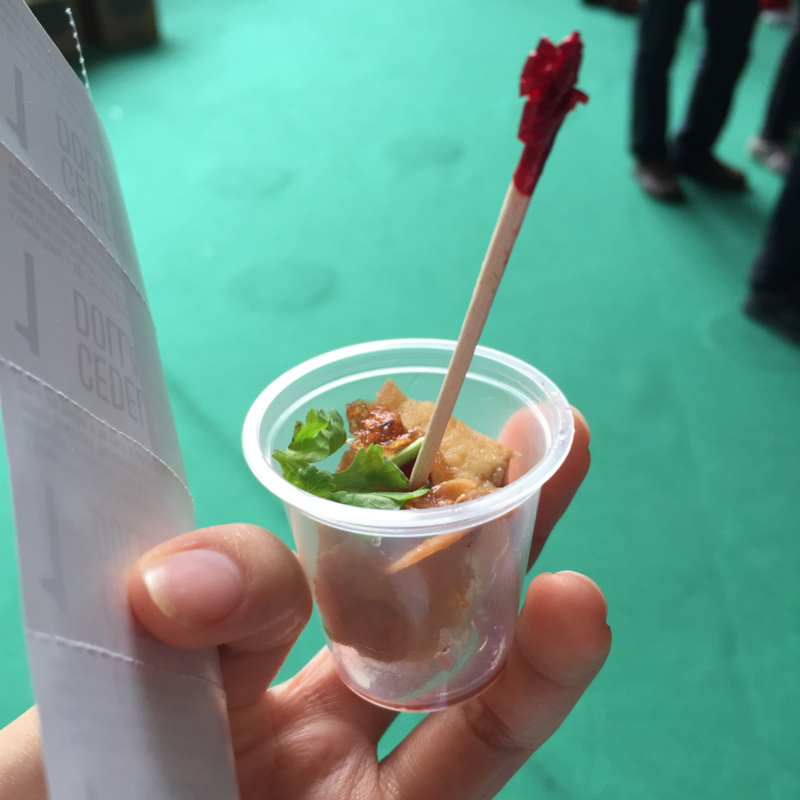 I really liked how it was flavourful but at the same time not too salty. The mushrooms were tender and went really well with the linguine. This combination together with the addition of sesame seeds, gave it an Asian flavour. I had also tried the Burmese Shan Tofu (top in previous photo) at the market and recommended my dad to get it. The tofu looked lightly-fried and was braised in some sort of soy sauce broth, topped with fried garlic and fresh parsley. I really like this one as well because I LOVE garlic. The tofu was also moist and tasty - seasoned to perfection. 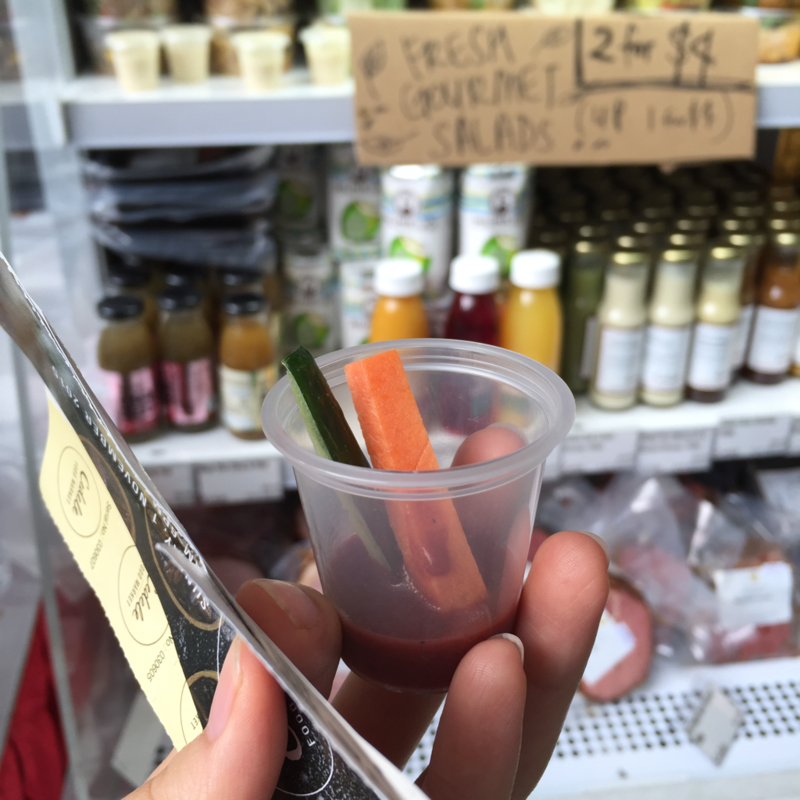 I also tried this raspberry vinegarette with carrots and cucumber. It was not bad! But not very memorable. These are the loots I brought back home! This was the wholemeal bloomer, which tasted like normal wholemeal bread I guess. However, I felt that the bread was a bit stale, but when toasted still tasted fine. 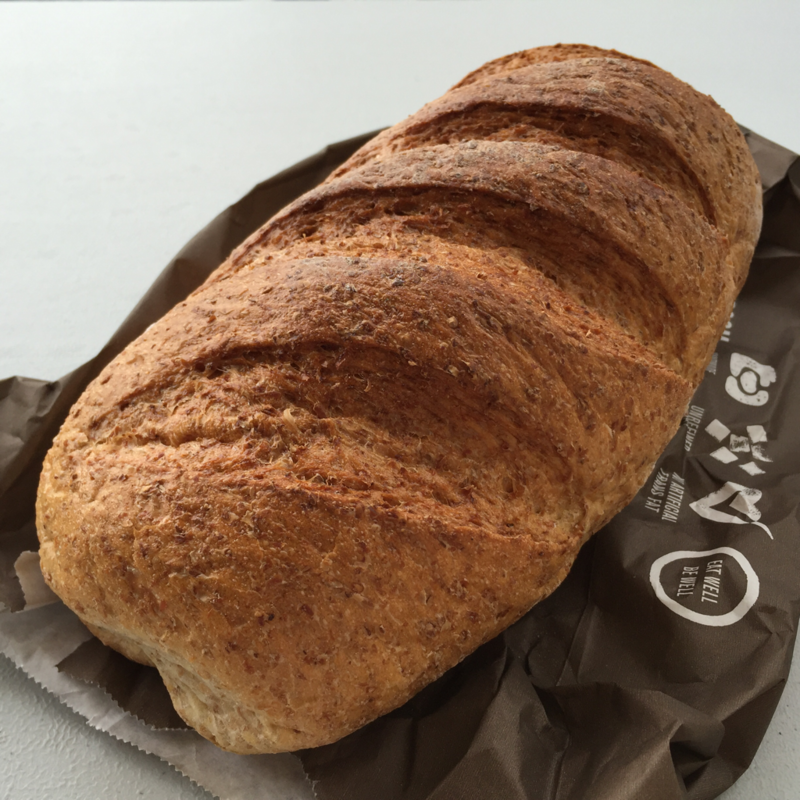 This was the wholemeal walnut bread that we got, we preferred this one to the wholemeal bloomer because it became crispier when toasted and had nice little bits of walnut in every bite we took. My only qualm with Cedele bread is that they get stale too fast. 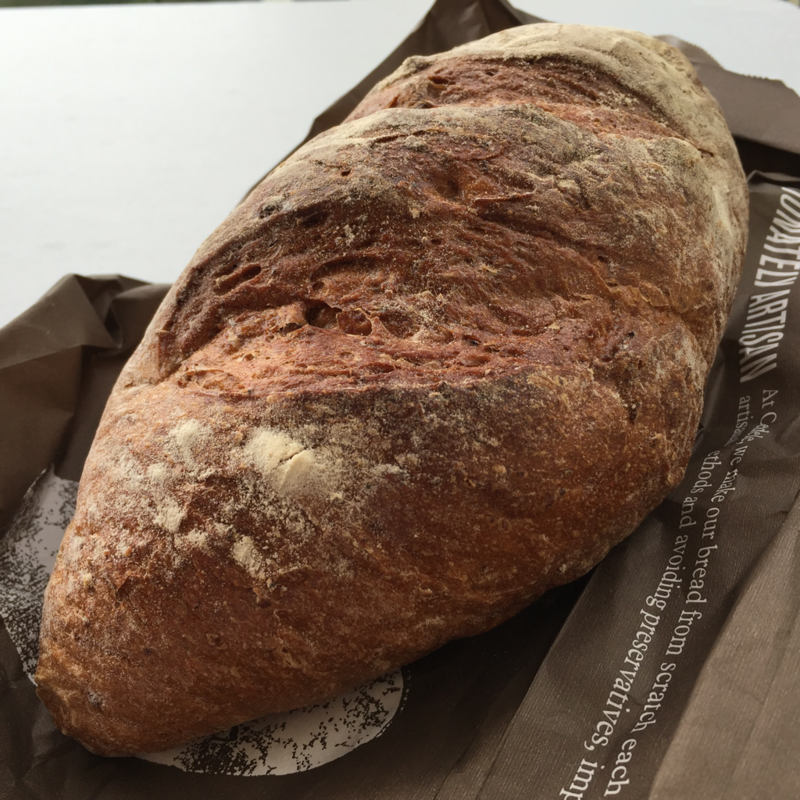 Anyone knows a good way of keeping bread such that it doesn't get stale too fast? My savoury toasts I made from the Cedele bread! 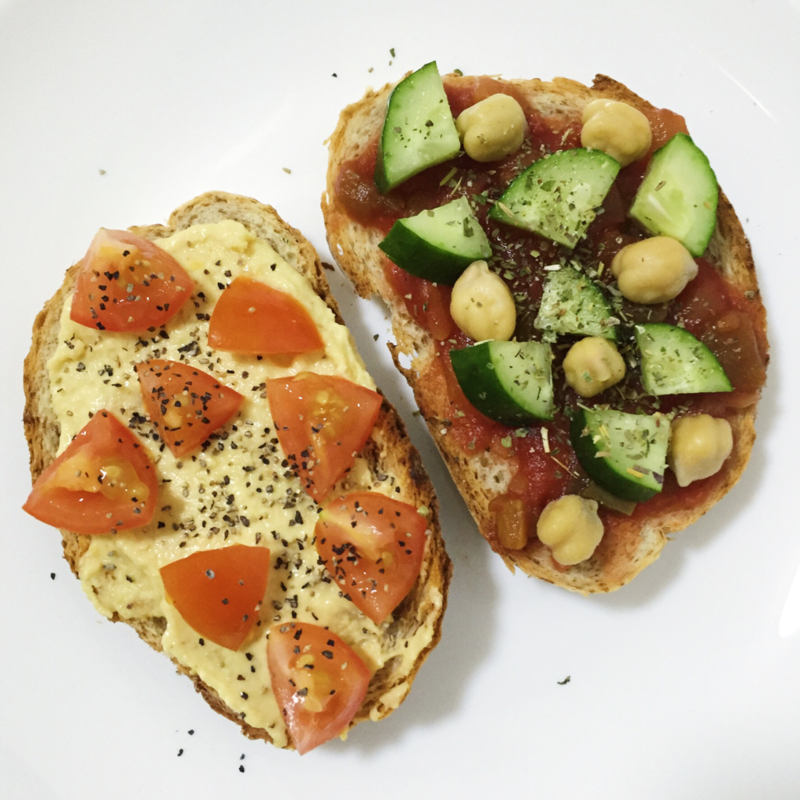 Wholemeal bloomer toasts topped with homemade hummus, cherry tomatoes & black pepper and salsa, chickpeas, cucumber and Italian herbs. Wholemeal walnut toast topped with Peanut Butter & Company's white chocolate wonderful peanut butter, berry muesli and Bonvita dark chocolate square. 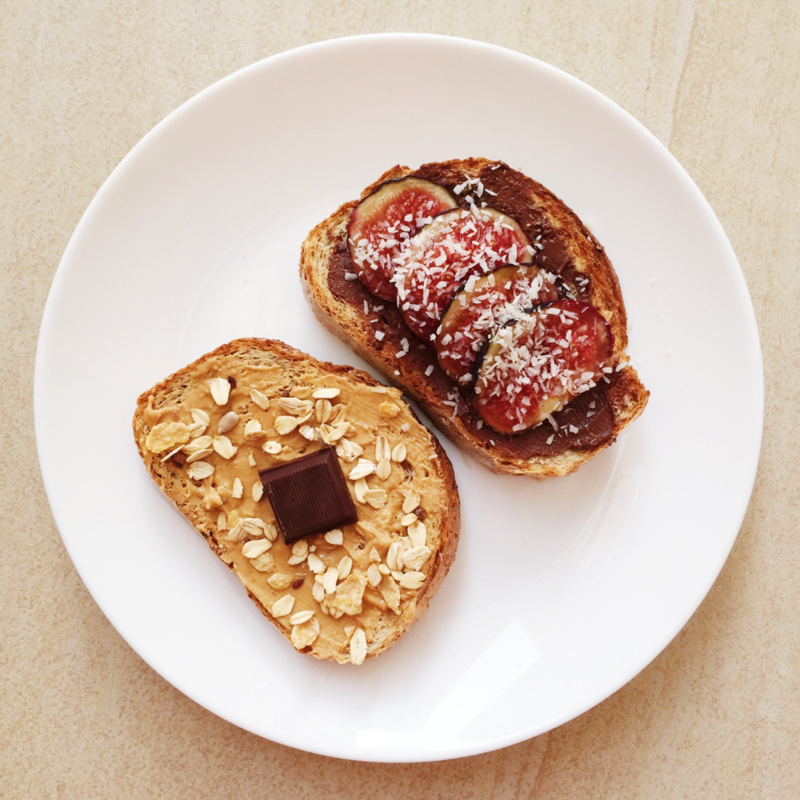 Wholemeal bloomer toast topped with Peanut Butter & Company's dark chocolate dreams peanut butter, fresh black Turkish figs and desiccated coconut. We got this juice together with another raspberry juice. 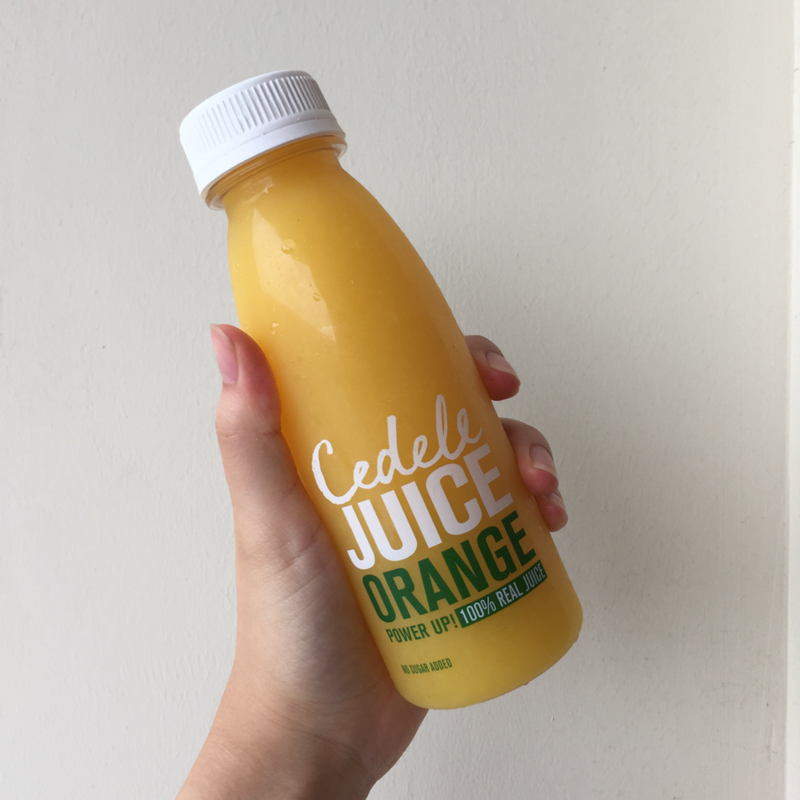 The juice tasted nice and fresh, not too sweet as well. 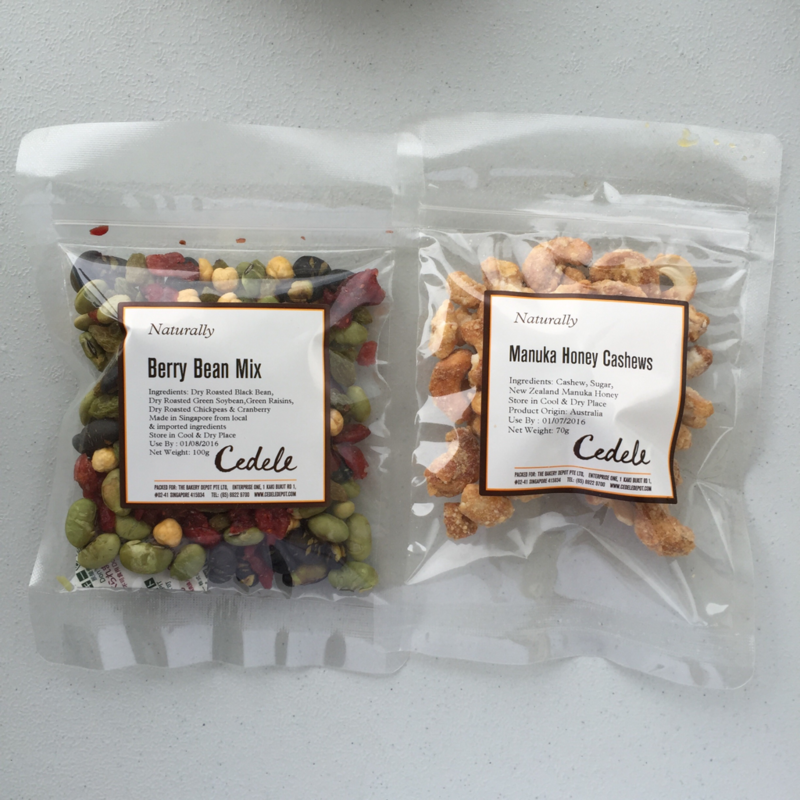 I bought 2 packets of the berry bean mix and 1 packet of the manuka honey cashews. I love the berry bean mix! The beans are really crunchy and go well with the dried cranberries. They isn't any extra salt added either, which makes it an even healthier on-the-go snack! 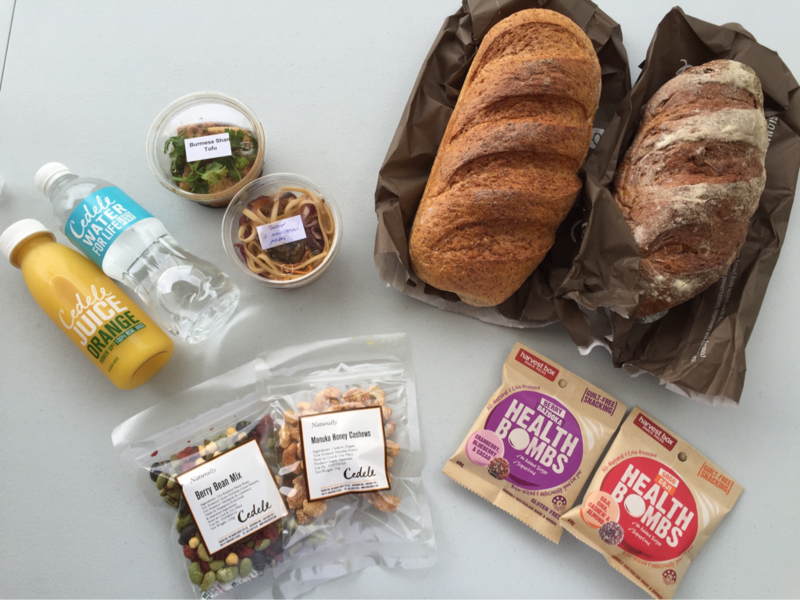 The manuka honey cashews are really nice as well! Not too sweet but really crunchy due to the layer of honey the nuts were coasted in before roasting. 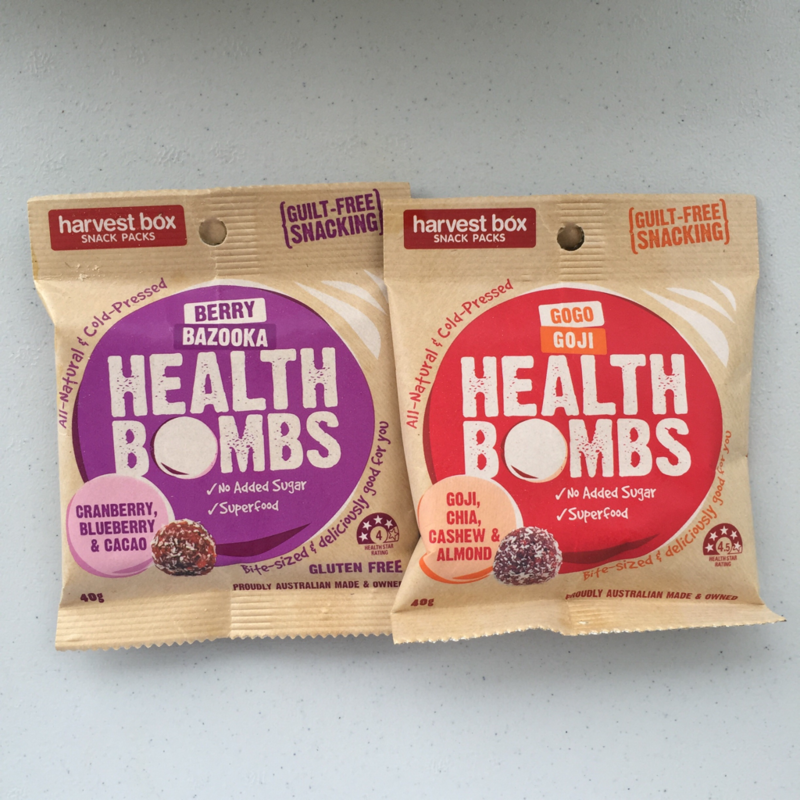 Got these two snack-packs because they look so good! Haven't tried them yet but can't wait to do so ASAP! I really enjoyed myself at the Cedele Christmas Market this year. 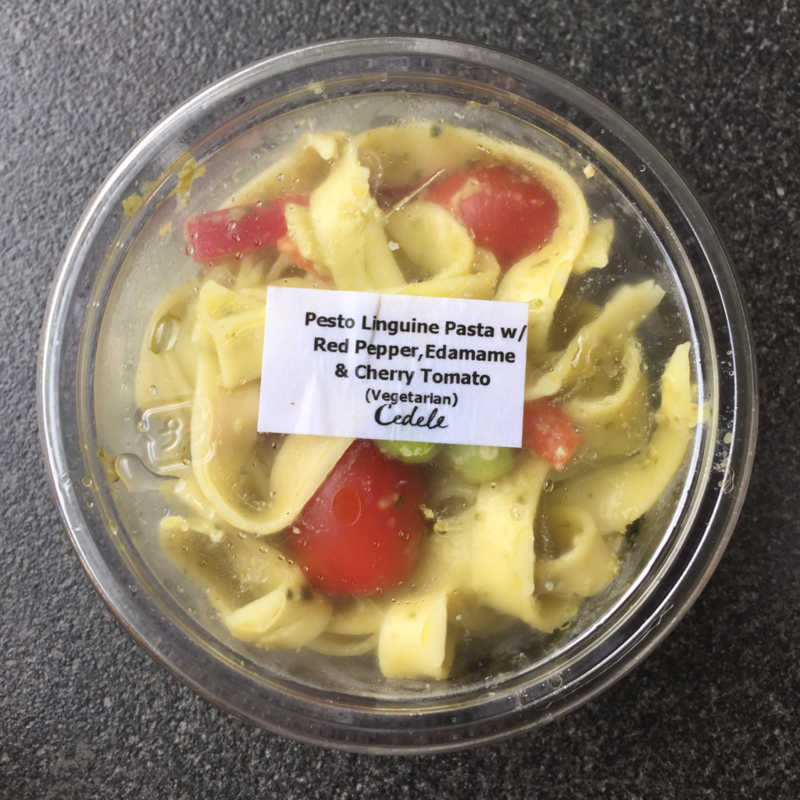 Not only do you get to buy some of Cedele's signature products at a discounted price, you also get to go around sampling healthy and good food and buy healthy organic food products for home-use! I sure hope Cedele will continue to hold more of these kind of events in the future!